On cool days, a warm meal is a welcomed treat that keeps Jack Frost from nipping at your nose. While salads are often associated with a way to cool down, there are ways to keep your favorite greens going strong in your diet even when the days grow cold. Taking hearty leaves, like romaine, and grilling them still gives you that traditional crispiness of a salad while adding that warmth your body craves. 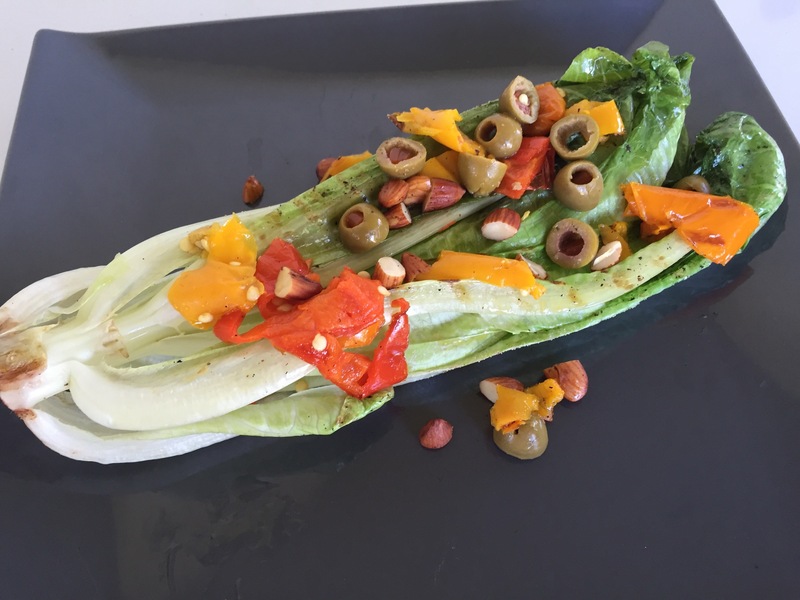 I opted for a Spanish flavor for this salad, and their dishes often feature peppers and olives. To add to the grilled taste and in keeping with the Spanish flair, I also added a bit of smoky paprika. Rich carbs, healthy fats, and nutrients from every ingredient keep your immune system in full gear during the flu and cold season! Heat a grill pan over medium-high heat. Generously spray or rub romaine (all sides) with the olive oil. Season with a touch of salt and pepper. Place on grill and grill for about 3-4 minutes a side, allowing grill marks to appear on leaves and for the head to heat through. In a small bowl, mix together peppers, olives, garlic, and paprika. Stir. Place romaine head onto dish, top with olive and pepper mixture, and then add on chopped almonds (marcona almonds are a Spanish variety, but raw almonds work too). Drizzle with a touch of olive oil if desired. *Roast your own! Lightly coat with olive oil and place on foil-lined cookie sheet. Bake at 400 for about 20-30 depending on size of peppers.